Mermaid’s Tale is yet another underwater gem from Novomatic. This particular slot game has 5 reels, 3 rows and 20 paylines. It’s another classic Novomatic-style slot game, so if you are familiar with their slot games, you’ll find it pretty simple to understand and play. The theme is quite girly (not to say that players of any gender can’t play this game!) and full of pastel colours, including lots of pinks and purples and oranges. The game centres around an underwater land of magic where the fish have personalities and the mermaids have lots of treasure. Mermaids are creatures of legends. Their first appearance in historic literature come from the Assyrian Empire! Assyrian legend has it that a goddess called Atargatis transformed herself into a mermaid after she fell pregnant with her lover’s child. Mermaids still exist in legend and sightings still seem to happen all over the world! Sometimes, mermaids are evil and lure sailors to their deaths! Generally, though, mermaids are thought to be beautiful women who fall in love with men. 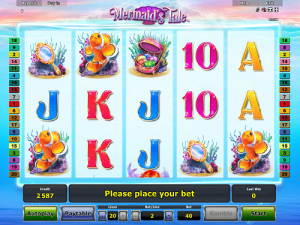 In Mermaid’s Tale slot game, the mermaid is definitely beautiful! It works like most other simple slot games from Novomatic. The paylines pay from left to right. There’s a Wild symbol which can expand to give you some big wins. Mermaid’s Tale can be played in auto mode or manually. You can gamble wins and bets are adjustable. There’s no way to win Free Games in Mermaid’s Tale but it’s still a fun game to play. Especially for any fans of Finding Nemo or The Little Mermaid, for example! Regular characters from most of Novomatic’s slot games are making a comeback in Mermaid’s Tale! These are the high card values and you’ll see them again and again on Novomatic slot games! In Mermaid’s Tale, these are colourful card symbols. The 10 is a nice pink, the Jack is a bright blue, the Queen is a royal green, the King is a cherry red and the Ace is a sun-coloured yellow! These symbols are the least valuable and they give out the smallest payouts. The Ace and the King are worth more than the 10, Jack and Queen. The mid-paying symbols are jewel-tastic! One of these symbols is a golden hand mirror, resting amongst the coral. The other mid-paying symbol is a chest of pastel-coloured jewels, resting on the ocean floor! The higher paying symbols are the aquatic creatures and they’re both beauties! The first is a clown fish and this pays out up to x25 your bet! Most of you will recognise this friendly fish as being the star of Finding Nemo! Although this character isn’t actually Nemo, he’s just a regular old clown fish, who’s friends with a mermaid. As you might have guessed, the symbol that awards the highest payouts of all is the mermaid. She’s a beautiful creature. She has a pearl necklace, a shell bra and a stunning head of red hair! Her hair is just the same colour as Ariel’s in The Little Mermaid! All of the characters in Mermaid’s Tale give payouts when they match up! The matches must land on consecutive reels and on one of the 10 paylines. These paylines run from left to right across so that’s how the symbols need to fall! You need a minimum of 3 matching symbols, in the right positions, to get a payout. The highest payouts are for x5 matching symbols (one across every reel)! It’s not uncommon for Novomatic slot games to have Wild symbols. These are symbols which usually have the power to behave like any other symbol. So, if you only land two matches (and you need three), the Wild can fill in as a substitute for the third match and get you a payout, so long as it lands in the right place. The Wild in Mermaid’s Tale is extra special. This can expand to cover entire reels! If you land 2 or more (on neighbouring reels), the Wild symbol will expand to cover them! A Wild symbol on reel 1 and another on reel 2 will both expand to cover both reels. Similarly, a Wild on reel 4 and another on reel 5 will expand to cover those two reels! If you spin a Wild on each of the reels 2, 3 and 4, these three will expand together to cover those middle three reels! When you land a Wild on the four rightmost reels, reels 2, 3, 4 and 5, they will together form one giant Wild across those reels. And, finally, a Wild symbol on every reel will transform all 5 reels into one giant Wild symbol!